After all, Instagram is the household name everybody recognizes. The platform boasts over 130 million monthly active users, built up over years of unchallenged success as an analog-inspired, square crop photo-editing app. Vine was refreshing and unique when it launched in January, but what is stopping its smaller userbase from jumping back across to Instagram? With an almost identical feature set and a likely larger group of friends to share videos with, Instagram is a better choice for many of its users. I’m not using Instagram for video though. I’m sticking with Vine. I’m not declaring its superiority, or that everyone else should support it over Instagram, but it’s a better fit for my workflow and how I use my devices. 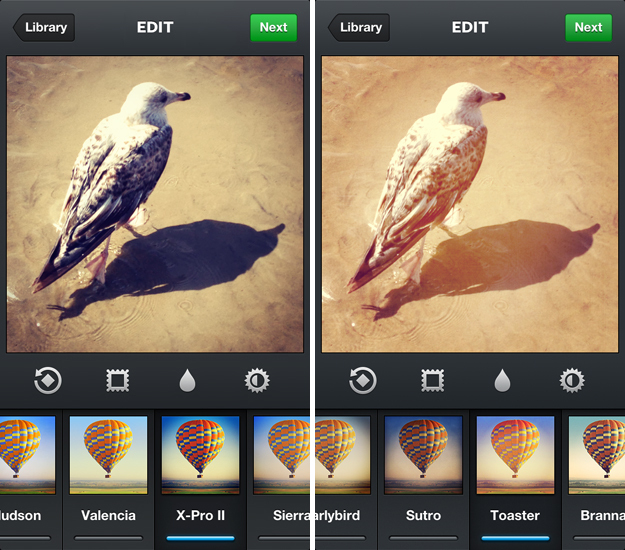 I used to love Instagram because of its simplicity for budding photographers. Each vertical stream was devoid of clutter, making it easy to quickly scroll down at breakneck speed and add a couple of ‘Likes’ when something of interest caught my eye. Checking Instagram used to takes about five minutes and then I was out, ready to move on to something else. Video breaks that experience. I often stop mid-flow in Instagram to look at some odd framing, only to discover that it’s not actually a photograph. Now, I know it’s possible to hide videos from my feed. But that’s me consciously choosing to avoid the feature. Clearly, video on Instagram just isn’t for me. Vine is a different proposition though. I don’t check the app as regularly as Instagram and that’s because it’s a slower, more thoughtful experience. 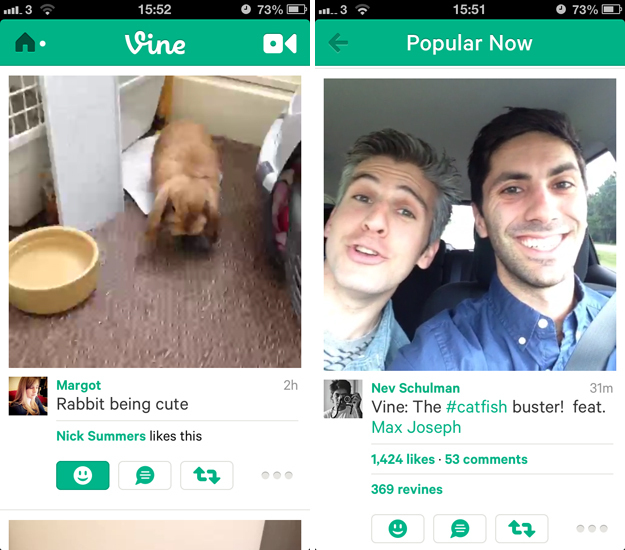 Unlike Instagram, it’s almost impossible to sprint up and down the home feed in Vine. Videos often take a moment to load and it takes exactly six seconds to watch each one. For me it’s a measured process, scrolling and pausing to review each in turn, possibly waiting for it to loop a couple of times and then adding a ‘Like’ or comment underneath. When I launch Vine, I know what I’m getting into. It’s usually the end of the day or I’m stuck for at least half an hour on the train. Rather like Pocket or Instapaper, it’s a conscious decision that I now have the time to give the app my full attention. I’m sick of filters. Instagram offers 13 and they all look pretty good, admittedly. But now that millions of people are using them day-in, day-out, they’ve quickly become pretty stale. That’s not Instagram’s fault – I’m just tired of the instantly recognizable red glow given off by Toaster, or the harsh blacks in X-Pro II. Vine is refreshing because it doesn’t offer these hipster-loving effects. Videos retain their original look, forcing users to rely on the natural light in any given scene. Clips feel natural, brighter and more detailed somehow, which is what I’m looking for in a video-sharing app at the moment. I understand that not everyone wants to use the Vine app. One of the most liberating parts of these new video-sharing tools is that it’s so quick to capture and share a recording elsewhere on the Internet. For me, that’s all about Twitter. When I record a quick clip on Vine I want all of my friends and peers to see it. For some, perhaps Facebook is the first port of call – but for me it will always be Twitter. Vine, being owned by the social network and all, has it easy. Clips show up in-stream and loop automatically, ensuring that users never need to leave the page or click elsewhere. Instagram doesn’t enjoy such luxuries, which has inadvertently encouraged some users to write link bait style captions before sharing them on Twitter. Again, that’s not Instagram’s fault. But when I’m sharing videos on Twitter, I want it to be as easy as possible for other people to view them. Vine therefore comes out on top. The Vine app has a couple of other neat little features that I really enjoy. The rule-of-thirds grid is a nice touch, as is the ability to set the focal point and review the previous clip in ‘Ghost’ mode. In the end, Vine is the app that I open by default. It fits naturally into my daily workflow and for now, I see no reason to switch to anything else. Perhaps that’ll change in time, but for now I’m happy where I am.